PROGRAM 1, In order of performance. Music stays in each key for about 5 minutes. Do not drive while listening to this music. Synthesizer music spontaneously composed in the Light Chamber of the United Research Light Center, Black Mountain, NC. 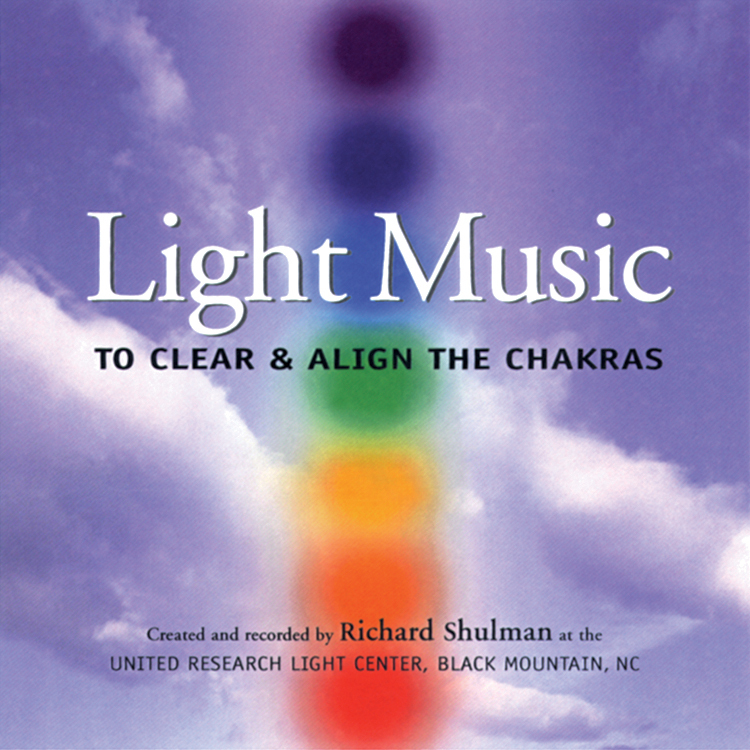 “Light Music” is designed to clear and align the seven major chakras. Two programs each present about thirty-six minutes of music beginning in the key of C (Red/Root chakra) and moving up the scale (spectrum and spine) to the key of B (Crown chakra). Dedicated to the expression of the Divine in form. Special thanks to the angels and masters of music, light, and healing, and to Jonathan Goure, who supported the recording of this music. As the music begins, sit comfortably in a chair with the spine supporting itself, and the feet flat on the floor. Let the feet relax and become soft. Take a few deep breaths, letting out tension with a sigh. Visualize a beautiful red ball of energy at the base of the spine, permeating, and enlivening the hips and pelvis. Feel or visualize this beautiful red color moving down through your legs and feet, and then deep into the Earth. Welcome the loving energy of Mother Earth responding to your energy, moving into your feet, legs and pelvis, and relaxing and rejuvinating your lower body. Allow the Earth’s energy to accompany you through the body, supporting you as you work with each chakra. When the music changes key, visualize or feel an orange ball of light forming in the belly just below the navel, expanding, vitalizing, and spinning clockwise (top of ball towards your left) until the color fills the lower body. With your intent, make it bright, vital, and joyful. At the key change, visualize a bright yellow light expanding from the solar plexus, behind the bottom center of the rib cage, expanding, strengthening, and enlivening. See this ball of light spinning clockwise, as bright as the sun. At the center of the chest, known as the heart center, visualize an emerald green ball of light expressing pure unconditional love. Allow this love/light to expand, filling the chest and radiating out the arms and through the hands, embracing all that you are…all that is. Bring your consciousness to the base of the throat and experience a blue light of truth expressing the Divine nature of your love. See this blue ball of light expand and spin clockwise, bringing greater clarity and effectiveness to your expression. At and behind the center of the forehead visualize a ball of indigo light spinning and expanding. Allow Mother Earth’s energy to rise up through the neck, filling the head, and supporting the vision/hearing/sensing in the indigo ball of light. At the top of the head, see a transcendent violet light expanding into a ball, filling and surrounding the entire head. Feel or see it connect with a golden light above the head. Bring the golden light above the head down into a focussed ball at the center of the head, between the ears. Connect it to the brow center in front and to the crown center above. Then bring this golden light to the heart center. Reconnect with Mother Earth, visualizing a golden light ascending from her core to your heart center, meeting and connecting with the light from above. While maintaining your focus at the heart center, allow the energies of Heaven and Earth to circulate freely, nourishing your entire being. Notice how centered you feel while connecting with and being supported from below and above. Remember this feeling, so you can call it forth whenever you choose. Gently become aware of your surroundings and gradually begin to move. Make sure you are feeling your feet firmly on the ground before resuming any normal activities.